Hello, all you graceful home makers! to see some befores and afters of other spaces. This will remind me that there is a light at the end of the tunnel. As you may or may not know, I am a home stager. an easy job, or even a "fun" job. It is hard, hard work. I have been staging since mid 1990s, taking jobs when I "feel like it". My main job, as you know is making my own home. is to work Full Time when Miss A goes off to college in three years. 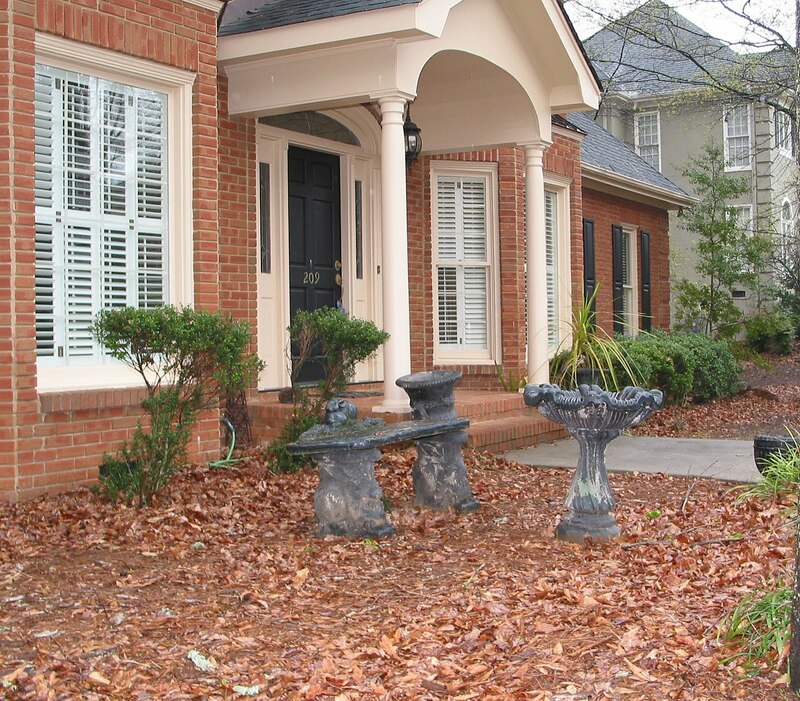 Today I wanted to talk about the importance of curb appeal. got 4 offers in 34 days. with only a few lookers. Upon first glance, this grand, stately home is attractive. But, let's slow down the car, and pull up in the driveway, park, and head to the front door. and needs to be pressure-washed. What else can you see that needs attention? 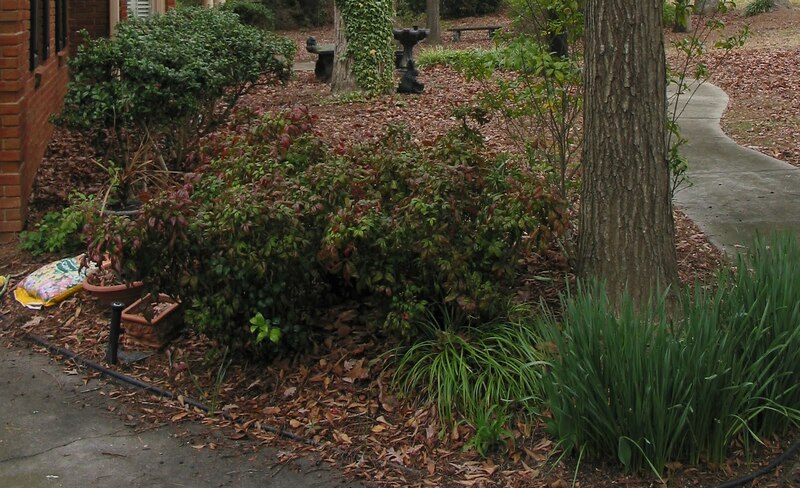 and the Crape Myrtles need to be pruned. This is the view from the car, when parked in the driveway. A concrete graveyard of yard art. Piles of autumn leaves, a hose, and mildewed brick. and landscaping that leaves a lot to be desired. Plantation shutters that are telling lookers to stay out. What are your first impressions of this home? 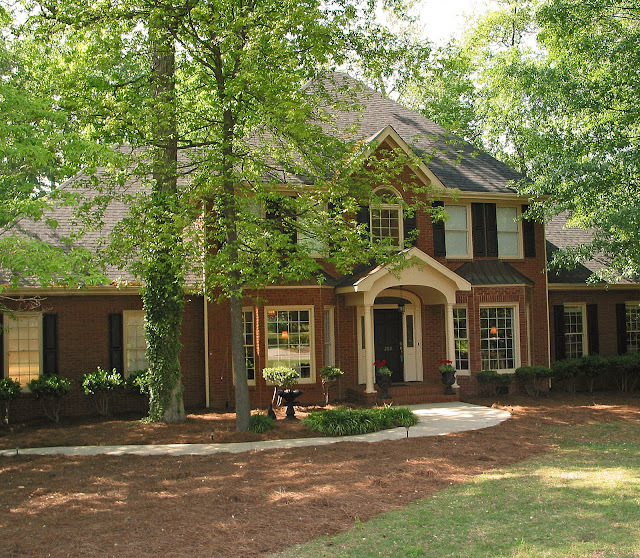 Here is the home after we showed it some love. The first person I call when preparing a house's exterior is my pressure washer. 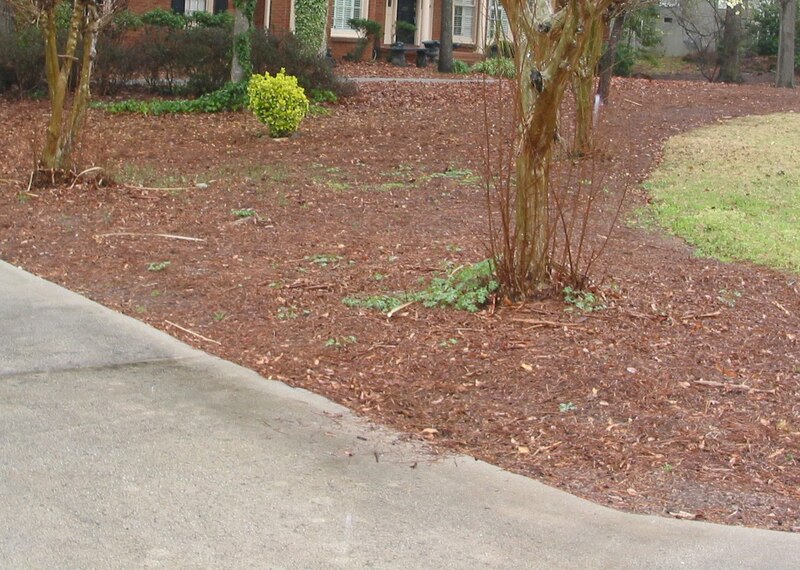 driveways, patios, front stoop, garage floor, gutters, and roof. solar lights were also added to the walkway for night drivers-by. set to come on each evening at 7 and stay on till dawn. (A formula for planting eye-catching combinations in containers. Select a tall, colorful or exotic plant for the thrill. and then fill with other compatible plants) for these urns to say "Welcome!" Remain detached emotionally from your house. See your house through buyers' eyes. It is not your home any longer. It is a building, a commodity that you want to sell for the highest amount possible! Park on the other side of the street, sit in your car and just study your yard and house. If you were thinking of buying your house, what kind of impression would it give you? Walk around your yard and make a list of areas that are great and a list of areas that need improvement. Take digital pictures, and look over them to see what you may have missed while walking around. Just before evening, do this exercise again. Your house will get more drive-bys in the evening than during any other time. 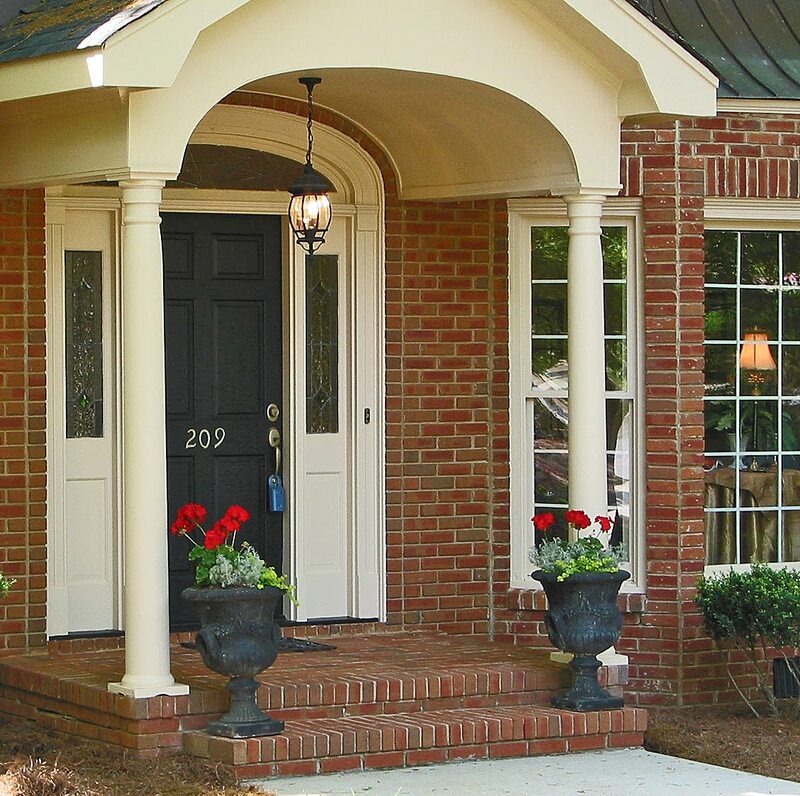 Your home must also have evening curb appeal. Put some lighting along the driveway, sidewalk and beds. Open the blinds and window treatments to let the interior light out. This is very appealing to a drive by prospect. Make sure your house is visible. If you are in a neighborhood, or subdivision and there are trees or shrubs blocking the view through to your front door, prune them so the front of the house and your house number are visible. A fresh coat of paint on the front door, a new door handle, and a new door bell button always make a great first impression. The BEST cure-all for a dingy home exterior: PRESSURE WASHING. The outside of the house should be clean to let buyers know that you have taken good care of their future home. Why should you create CURB APPEAL? and want to buy your house! 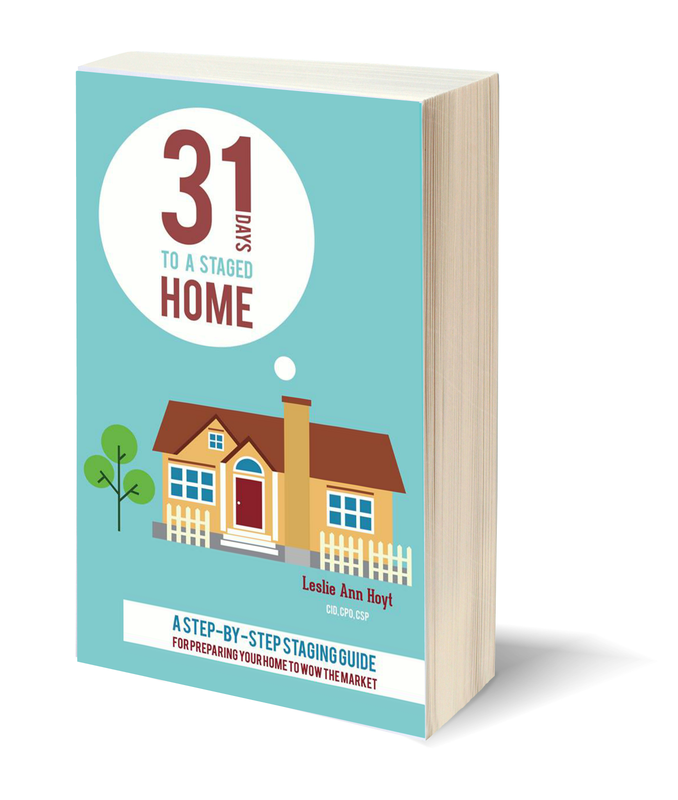 they're all here in my new e-book, 31 Days to a Staged Home. Click the book to be taken to Amazon to get a copy for yourself or to share. Great post girl!! I'm gonna work on my curb appeal this weekend! I've been working on the inside of my house so much, I've been neglecting the outside. It's lookin' a little sad. 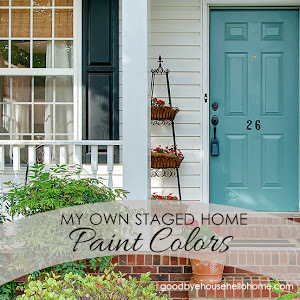 I can totally relate to this post as a Home Stager myself. It is not glamorous, fun or easy-that is for sure.I laugh when people ask what I do, they say, "Oh, that sounds like such a fun job" and I say yes but am sure to correct them so they understand that is a LOT of work like any job. LOL. Curb appeal is so important. Admittedly, it's been so hot here that other than cutting grass, raking leaves (we get ours in spring) and planting a few flowers, we haven't spent a whole lot of time on our yard. Oh, yes please share it with your facebook friends. Wow-7 years! You know the funny thing is about 8 years ago I met a couple who shared a car (this was rare for me) and my words at the time were, "Oh, I could never do that. I enjoy having my own car". I guess someone wanted to show me that I CAN do it and it's really not all that bad. One day when we get car #2 it will be that much sweeter! 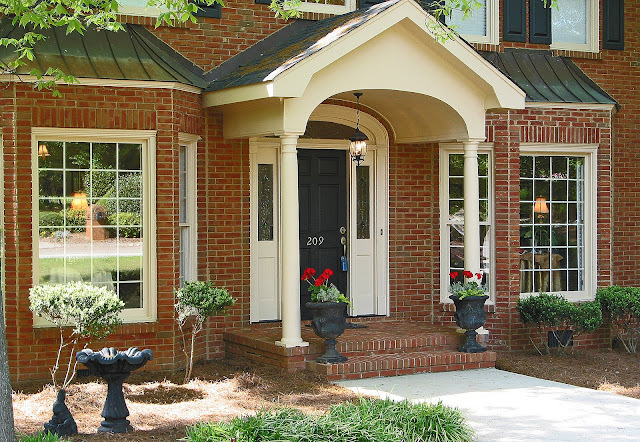 I think about curb appeal everytime I enter my front door. The door paint needs touch up and the covered area in front some clean up, spruce up. Your post was an inspiration. I loved this! I hope you post more of these. I'd like some interior before and afters too. Your ideas would apply for making any house presnt its best face forward, right? Great tips! Where were you when we were selling! We did however do most of your tips. New door, fresh paint on front porch, mulch and flowers, edged the lawn. Inside we packed up all our stuff and just left the necessities. Freshly painted every room. It was beautiful! And sold fast too! The house looks amazing now! Great job and great advice! Great post. I so agree with you! It's a lot of work to sell your house. When we were looking for a new home I was amazed at how little some people do when they sell. Like not even clean it! Our house sold in a week last year because we spent a little money to do some improvements that made it stand out. We ended up making money in a bad market and we sold it fast so we didn't have the costs of two households. It does make such a difference! It looks so much better. I've always thought staging was a great job....I've changed my mind now!Have a great day! Awesome job! TY for posting & for your inspirational comments. Of course, our house had NO curb appeal when we bought it. Then again, the interior has also needed lots of work. However, we are dedicated to improvements--inside & out. This is going to be an ongoing process, but even some of the things we've done thus far have produced enough curb appeal that we are getting positive comments from neighbours & others whom walk by our place in the evenings (mostly). Leslie, what a great post! You've certainly covered all the bases here. 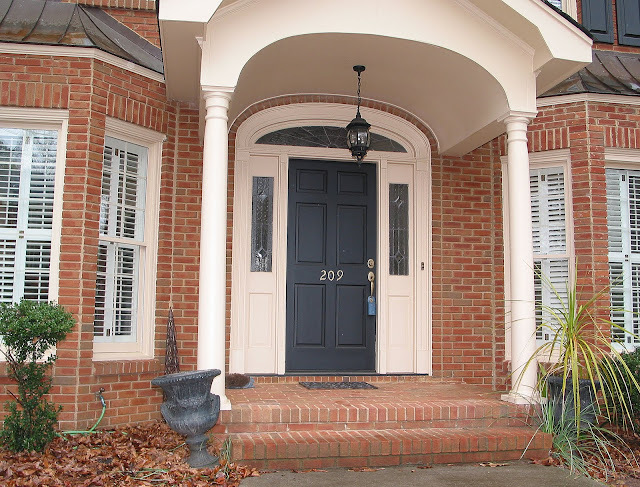 We just recently re-painted our front door (from drab beige to billiard table green) and I'm amazed at the transformation. I still have lots of outside work to do around here ~ thanks for the gentle nudge! 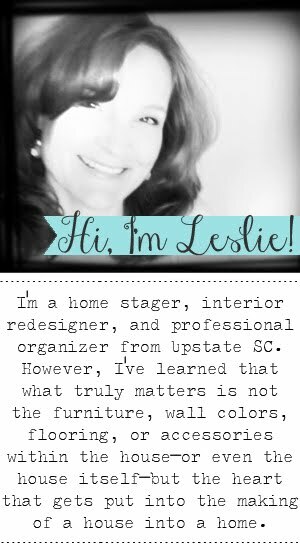 I didn't know you were a home stager! I imagine the worst part of the job is dealing with home owners that still emotionally invested in the property and don't want to change anything. As buyers, Thomas and I were able to look past cosmetics but many potential purchasers are not. It amazed me how many homes we looked at that weren't even cleaned let alone staged! Thank you for sharing that a few very doable things can make such a dramatic difference in your home's appearance, whether you are selling or not! Wow! You have great sense of what needs to be done! Cool job. I had a question for you while I am here. In one of your photos you show kitchen counter stools. We have the same exact ones! But, I need two more. I found our three on ebay and painted them. Where did you get yours????? Thanks in advance for your time! Love your blog! Fabulous- the Staging and the sharing! It looks great! When we were looking at houses I was shocked that people really didn't seem to care about their houses or so it seemed by how the houses looked. Thanks also for the info for me to get a button! It really helped! It never ceases to amaze me that some homeowners just don't get it. 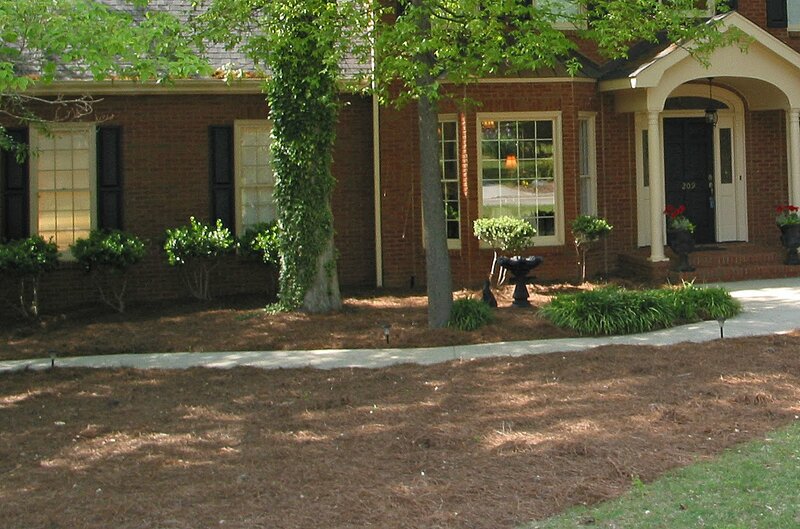 Curb appeal not only helps sell your home quicker, it also adds value. I think you've done a great job with that house. I think the before and afters really get your point across! Wonderful curb appeal. It really is the most important factor...if it does not appeal on the outside, who wants to come in? what a beautiful house....looking so fresh...like it. Definitely a big difference there! Really, walking into a house that looks abandoned really sets the tone for the whole walk through, not to mention I think it makes you look at every detail with a more critical eye. Well done! Awesome house there. I like a place where is peaceful like you can rest in the evening without worrying that someone will attack or rob your house. a best guide on this topic. It covers all the essential points and I really like this part of the information on seo.